We are now working with Exodus 24 and 25. The subject matter of chapters 25-31 is the tabernacle that Israel was to build for Yahweh. The key passage for these chapters is Ex. 25:8-9, "Then have them make a sanctuary for me, and I will dwell among them. Make this tabernacle and all its furnishings exactly like the pattern I will show you." In chapter 24 Moses and the leaders were called further up Mount Sinai following the covenant cutting ceremony. As they went further up the mountain they entered into the Presence of God. Exodus 24:11 says "they saw God, and they ate and drank." On a humorous note, the order is important to note: see God, then eat and drink. I have a friend who sees God all the time, but he usually drinks first. What is it that qualifies a person to be a leader of the people of God? I think we see it in this passage (Ex. 24:9ff.). The call of God and the encounter with God are necessary to be a leader of the people of God. God called the leaders higher up the mountain. As they answer the call, God made them competent to lead by granting them further entrance into His Presence. We saw this most clearly with the burning bush call of Moses. Now we see it on a larger scale with Israel's leaders. It is not education, status, wealth, age, etc. that ultimately makes one competent. Yahweh Himself "competents" His leaders by calling them and meeting them as they answer. If you are in a leadership position or you seek to lead, realize that the bottom line of competency is God's call upon you and your meeting with God, that is, the Presence of God in your life. Moses was called still further up the mountain. The amazing encounter he had with God was what set him apart as Israel's most important leader and greatest prophet. For forty days and forty nights he lived intensely in the Presence of Yahweh. It was during that incredibly intimate time with Yahweh that Yahweh gave Moses all the details of how the tabernacle was to be built. "Have them make a sanctuary for me, and I will dwell among them. . .."
When you hear sanctuary what comes to your mind? Given popular usage in English, I doubt if very many would immediately respond "a holy place." Our English does not really capture the connection between sanctuary and holy, but that connection is unmistakable in Hebrew. The word for holy in Hebrew is qadosh, using three principle consonants, QDS[h] that communicate "holy." It's what Isaiah heard the angels proclaiming when he saw the LORD seated upon His throne (Isa 6:3). The word for sanctuary is miqdash. It is formed from the same three consonants QDS[h] with another letter added, "M", that indicates a noun. When one hears miqdash, one cannot help but hear qadosh. Holy is the root word and idea of sanctuary. Sanctuary is Holy Place. Now here is where it gets exciting. God called Moses up Mount Sinai into His Holy Presence and told Moses that he should go back down the mountain and make a Holy Place for God to dwell among the people. God called Moses up for the purpose of sending him back down. The top of Mount Sinai had become the most holy place on earth because God had settled there. God called Moses into this holy place and then told him to go down and make a holy place at the bottom of the mountain. God singled Moses out from the people, but then sent him back to the people, that God might not just meet with Moses but dwell among the whole people. Moses was granted this indescribable mountaintop experience of God, but the whole purpose behind it was to make a valley dwelling place for God. Moses is not supposed to stay on the mountain. Moreover, Yahweh has no intention or desire to stay on the mountain. Yahweh seeks to dwell among the people. Moses was called up to go down to make a place for Yahweh to dwell. Moses was called high to make a low place for Yahweh to be Present. Mountaintop encounters are for sea level construction projects. The high calling of ministry is to make a holy place for Yahweh in the depths of humanity. Moses was called high up the mountain to be sent low among the people. He was to make a place at the bottom for the One he met at the top. The goal of the minister/leader is to make holy places among the people for God to dwell. That goal comes from the God who calls up in order to send down. Yahweh wants to dwell among His people, to settle down among them, to tabernacle/pitch tent in their midst. In our last study we examined the covenant cutting ceremony in terms of marriage. What does a couple do after their wedding and honeymoon? They move in together. That's what Yahweh wanted to do with Israel. Now that they had given each other their "I do's" Yahweh told Moses what to do so that He could move in and become abidingly Present. Moses was charged with the responsibility of making a place fit for Yahweh to dwell in. Again, it is beyond grasping. The One Who Is, the Creator of the heavens and earth, the One enthroned above, seeks a dwelling place amongst a powerless, basically no-name people. Yet, because Yahweh is Yahweh, a holy place would be required. It is Yahweh's Presence that will actually make the place holy, but the people would have a part to play in the construction of this holy place as well. The abiding Presence of Yahweh among the people is related to the people preparing and maintaining a holy place for Yahweh to dwell in their midst. As other passages in the Prophets make clear, God will not force himself on a people who are unwilling to accept a Holy God in their midst and who create unholiness and pollution by their sin (for example, Isa 24:5, Jer 3:1-2, Eze 23:28-30). It is not that the sanctuary is magical, but that it becomes symbolic of the holy Presence of God among the people. Yahweh told Moses to collect an offering from the people in order to acquire the materials needed for the tabernacle. Not just any old offering will do. From the list of things, we see that the people were to bring their best. We also learn that they were to give according to the prompting of their hearts. The people were to give their best and they were to give it from the heart. Second best would not do and only joyful giving was acceptable. If Yahweh is to dwell amongst His people, there would be no room for them to hold back their best nor to give it grudgingly. Yahweh's abiding Presence demands total yielding of possessions and heart. The rest of chapter 25 deals with the furnishings of Yahweh's tabernacle. The first item mentioned is the Ark of the Covenant. This was a gold-covered wooden chest about three and a half feet long and a little over two feet deep and two feet wide. In it was to be placed the covenant, namely, the Ten Words. Thus, the Ark of the Covenant was the ongoing testimony of Yahweh's commitment to Israel and Israel's pledge of faithfulness to Yahweh. Staying with our marriage analogy, the Ark could probably be best compared to wedding rings. Wedding rings are an ongoing expression of mutual covenant commitment. They keep husband and wife present to each other. Through the Ark Israel and Yahweh stayed present to each other. 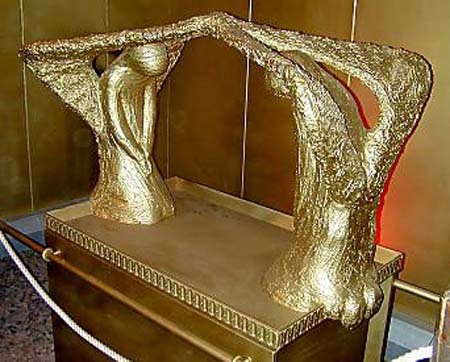 The Ark was to be covered with a gold top known as the atonement cover or mercy seat. It consisted of a couple of cherubim mounted on a top plate. The cherubim faced each other with empty space in between. According to Exodus 25:22 it would be in this empty space that Yahweh would meet with Israel and instruct them for life. It is difficult for us to appreciate how strange this must have sounded to Moses and the Israelites. The common way to worship a god was to make a statue or image of him/her. One might have small, "carry out" images of the gods to use at home or on the road. Temples came furnished with huge images or idols of their host deities. Yet, here was Yahweh telling Moses to build a tabernacle and He would meet them in the empty space between the angels above the Ark. No image or idol of Yahweh was to be constructed. Yahweh could not be reduced or reproduced. Human hands cannot make Yahweh, for Yahweh is the maker of human hands. Likewise, humans cannot make an image of Yahweh, for Yahweh has created humans to be/reflect His image. The cover was called the atonement cover or mercy seat, not because it was a seat but because God's Presence was seated there. Visualize the relationship between the Covenant and the Mercy Seat. The Mercy Seat is over or covers the Covenant. Our covenant with God is covered over by the mercy of God. Our pledge of faithfulness is covered by God's atoning mercy. The second item of furniture was a table, upon which would sit the Bread of the Presence. Back when I was in college working security on a graveyard shift, I can remember thinking about what the most important piece of furniture on campus might be. I determined that amidst all the desks, lecterns, chairs, pulpits, altars, beds, and everything else, the most important piece of furniture was the cafeteria tables. Why? Because that is where life was shared most. Whatever was going on, it got talked about over those tables. Yahweh wants a table in His house. I think Yahweh wants to share life together. The Bread of the Presence, which was always to be on the Table, replaced with fresh bread weekly, symbolized Israel's constant offering of thanks to Yahweh for bread and daily sustenance. It also served as a powerful reminder that our daily bread, indeed life itself, does come from Yahweh. The third piece of furniture was a lamp stand. It was to be shaped somewhat like an almond tree budding with blossoms. There were to be six branches, three off to each side, each having a lamp along with the center lamp, thus making a total of seven lamps. The "treeness" of the lamp likely served as a reminder that Yahweh is the tree of knowledge. It is Yahweh who grants wisdom, insight, and discernment. This fits well with the light theme too. The almond theme may point to Yahweh's watchfulness. In Hebrew the words "almond" and "watchful" sound almost identical (note the play on those two words in Jere. 1:11-12). With this almond lamp Yahweh may be saying to Israel what He would later say to Jeremiah in his vision of an almond tree: Yahweh keeps watch. He does not slumber or sleep. He is the light that does not go out. These furniture items, and indeed the whole tabernacle, were to be the means for Yahweh to be Present in the midst of His people. They are not "means" in the sense that they become magical amulets or physical representations of God. But they do symbolize the relationship between God and the people, so that as the people prepare, maintain, and come to this "holy place" they express their commitment to this God who has led them out of Egypt and met with them on this mountain to enter into a covenant that calls them to be His people. The sanctuary and its furniture also symbolize the very real Presence of this same God in their midst, constantly calling them and enabling them to live out their covenant commitments in daily life. By the grace of God may we become a holy place, a sea-level dwelling place for the One Who Is.